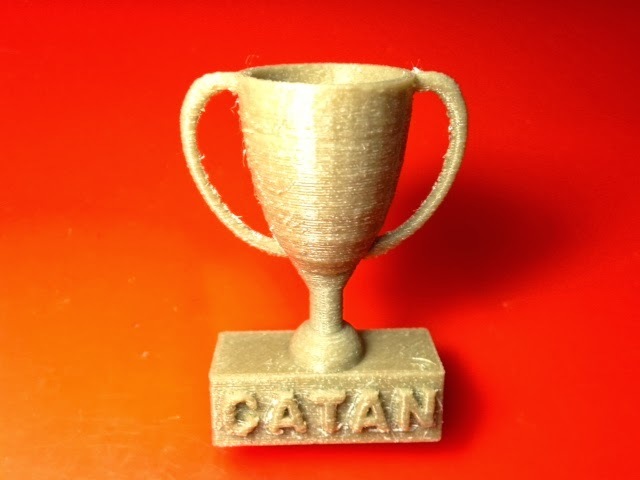 And for the winner of Catan, a trophy! The current winner in the house gets to display this tiny trophy on their shelf. This was made by our 8-year-old son by modifying Josh Goldenberg's Championship Trophy on Tinkercad. Settings: Afinia .2mm default normal, in 49 minutes. Technical note: This was our first test of Afinia's Value Line gold filament. It's definitely not as nice as their Premium Line filament - sort of rough and stringier - but it prints up okay and even has a sparkly type of finish. This particular model printed with only a little of support under the "C" and some very tiny support lines in a couple of other strategic places. Stuff you might want to change: A heat embossing tool might clean up the rough spots?